It’s not a very good idea to get a lifted pickup—primarily because it’s a rather unattractive thing to do to a truck. But secondarily because if you ever try to crawl up into one while drunk, you’ll look even dumber than usual. There is a lot to like about this video, including the fact that this guy is wearing a high-visibility vest, as if his actions weren’t already making him plenty visible. We’re also genuinely impressed at his ability to, in spite of his apparently profound inebriation, swing the door shut without slamming it on his fingers or hitting his head on the roof. Our only real criticism of the video is that it was filmed vertically instead of horizontally, robbing this three-minute masterpiece of the cinematic widescreen format it deserves. We are hoping, though, that the reason this video ends so abruptly is because the smartphone’s owner stopped filming and ran outside to prevent the man in question from driving while intoxicated. 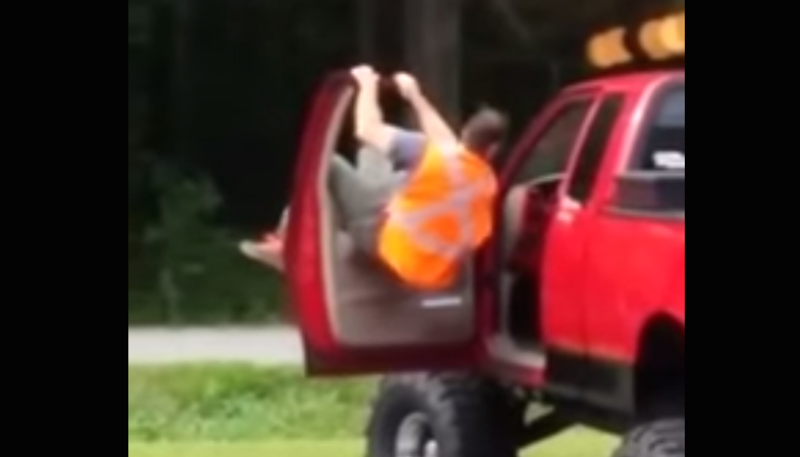 A drunk guy crawling all over a lifted pickup truck is very funny, until he actually makes his way into the driver’s seat, at which point it can quickly turn from comedy to tragedy.